Mumbai is famous for two things - hospitality and food. 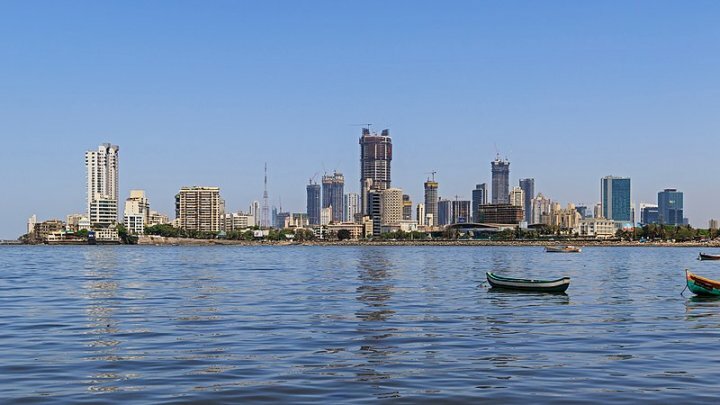 Home to some of the most welcoming people, Mumbai has a treat for everyone. The tangy flavors will surely make your mouth water even when you hear the dishes' names. So, go ahead and treat yourself at these amazing food joints in Mumbai. 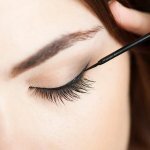 Do you want to visit Mumbai? Want to know more about the food offered there? Don't worry because Mumbai is a cosmopolitan city which is also famous for its lip-smacking dishes. Be it vegetarian or non-vegetarian, the dishes here surely offer impeccable taste and exciting flavors. The cuisine of Mumbai covers an extensive array of exciting and authentic dishes in single platters. The history of food in this city is linked directly to the growth of the city. As the city grew from a fishing village to a metropolis, many immigrants from across the globe brought their culinary treasures with them, resulting in the plethora of cooking style and the street food which can be witnessed along with cosmopolitanism and carbohydrate-fueled work ethics. Street Food is heaven for the food-lovers. India is a country that tops the chart for offering the best street food. The streets are full of people fleeing like swarms to enjoy the scenic views, the scouring flea markets or just chilling out with friends. But this picture seems incomplete without the exotic and delicious street food stalls at the junctions which act as the added masala. Be it the aloo chat or the golgappa stalls, India has a variety to offer. 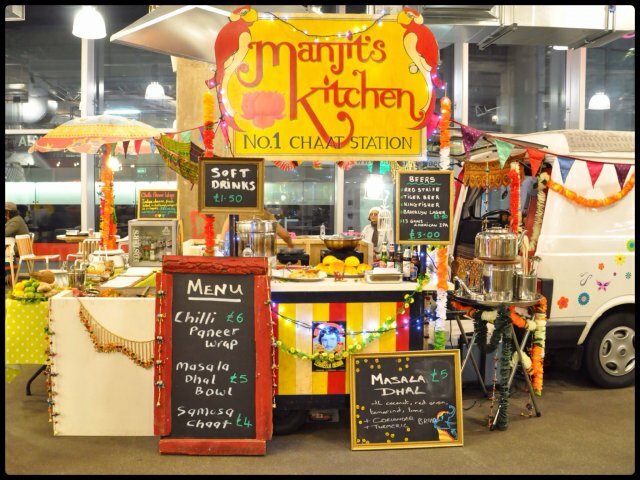 Indian street food is made with the mélange of varied ingredients and exotic spices. They are indeed, one of a kind. Apart from the locals, a lot of foreign travelers are fond of Indian street food. Imagine strolling through the streets of Mumbai without having the cutting chai or grabbing the oh so good vadapav or a hectic day of the street shopping without a lip-smacking pavbhaji or moving through the Park street of Kolkata and walking without having the famous Golgappas/ puchkas. If we think about street food, India is a proud nation as every state and city of the country has its own speciality. And this wide variety of delicious and cheap street food is enough to increase our hunger pangs. But What Makes The People of Mumbai And its Cuisines So Special? Bombay, also known as Mumbai, is considered as the city of dreams. Apart from being the largest metropolitan city, it acknowledges a boisterous blend of cuisines, language, fine arts and most importantly, the cinema. If you are thinking of stepping in the land of Mumbai, be ready for the adrenaline rush and the foot-tapping diverse city life. The crowd in Mumbai is regarded as the chirpy, tireless lot who have become streamlined with the fast-paced life of the city. Popularly known as the ‘Mumbaikar or the ‘Bombayite', the people here are considered to be hardworking, witty, cultural, modern and approachable people who are very outspoken in their lives. 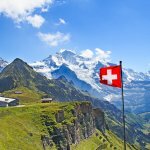 The nature of the locals make foreigners feel at home. There are two things, which every Mumbaikar is passionate about, Food and festivals. Ganesh Chaturthi, Diwali, Eid and Christmas are the festivals that are celebrated all year round in Mumbai. 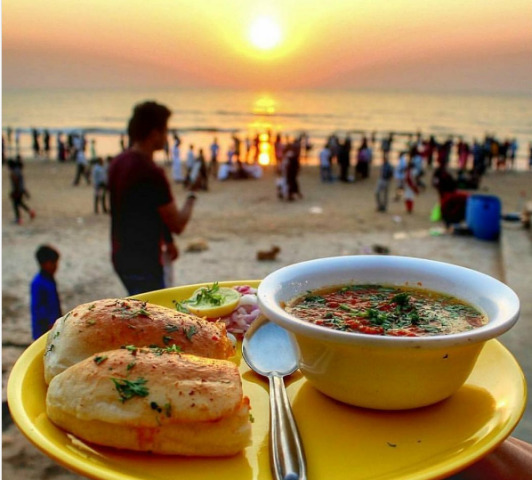 Besides these festivals, the mouth-watering cuisines, which have adopted their recipes through the diversity, are considered as a unique part of Mumbai. The metropolis is widely famous for its street fares such as VadaPav, Chakli, BatataVada, Modak, Chivda, Dabeli, PaniPuri, DahiPuri, SevPuri and many more. Apart from the street cuisine, the Maharashtrian Food, Mughlai, Malvani, Punjabi and other cuisines have caught on as some of the lively fares in this city, making the travelers crazy for Mumbai's specialties. When it comes to food, one cannot sacrifice his/her health. Just as the taste, even the quality matters. The quality of food not only depends on the appearance, but the also the texture and flavor of the food. 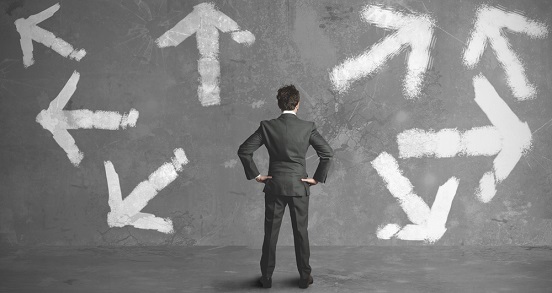 With technological up gradation and innovation, today, most people rely on the world of internet to search for everything which is essential to them. Food is a crucial topic which is widely searched online. If you are visiting Mumbai, and you are not aware of the authentic food joints, then the internet comes to your aid as there are online platforms which provide information about every cuisine that can be eaten in Mumbai, along with its price and quality. There are also websites like swiggy and zomato, searching through them, you can refer to the experiences of residents, who provide genuine reviews about the food joints. Thus, if you are planning to visit Mumbai, it is essential to do a thorough internet research about the different cuisines being offered and where to find the best quality. One can surely rejoice in the cultural diversity of Mumbai and the culinary richness which it offer in terms of street food and other cuisines. The flavors, colors, textures and taste let these dishes pop into your mouth without burning a hole in your pocket. 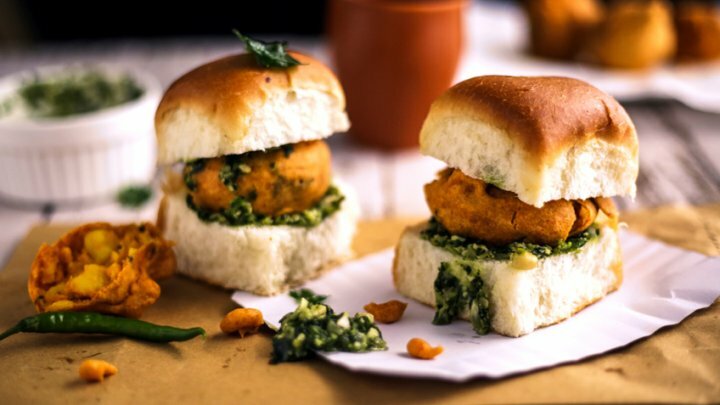 When we think of Mumbai, the first thing that pops in our mind is the famous VadaPav. They are the Indian version of Burgers. Once considered as only a food for the poor, this iconic street food today has become famous among the rich and famous as well. Everyone, whether a student or a wealthy elite businessperson, flocks to the vadapav stall every day. The roadside stalls are the best place to enjoy this Marathi cuisine. Although the concept of making this authentic dish remains the same, the vadapav from AnandVadaPav , which is opposite to Mithibai College, Juhu, is offering a meal for 2 at Rs. 100 and has quite large fan following. And this is all due to the crispy patty and perfectly crisp buns mated together with some fierce green chillies on to the sides. This is another favorite street food of Mumbai. 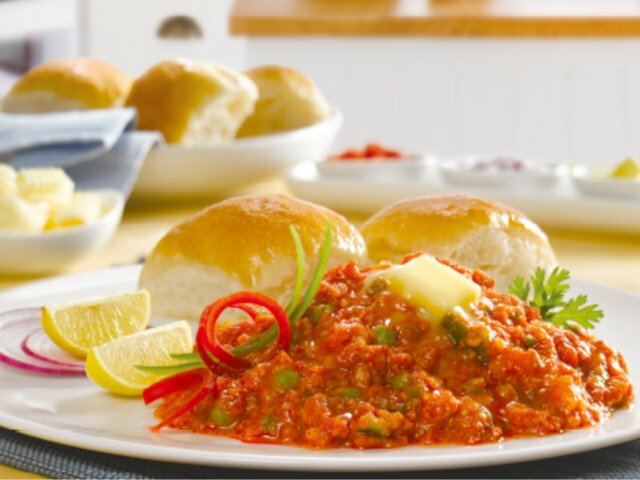 This specialty is from the by-lanes of Mumbai and is made up of mashed steamed mixed vegetables, especially potatoes, peas, tomatoes, onions and green pepper which is cooked in different spices and loads of butter. It is eaten with pav which is shallow fried in more butter and with some chopped onions. People across the country visit Mumbai to taste this delicacy. 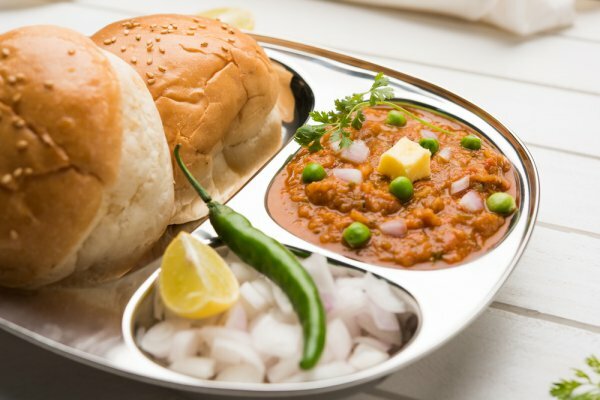 While there is a sheer number of pav bhaji outlets in Mumbai, but if you do not have it at Sardar Refreshments, then your trip to Mumbai is futile. It is a 5 minute walk from the railway station and offers a meal for 2 at Rs. 350. Apart from the mouth-watering pavbhaji they even offer side drinks. When it comes to a famous vegetarian dish among the street food, in Mumbai we mainly hear about Sev Puri. It is nothing but a tangy chaat which includes puri which is loaded with some diced potatoes, onions and three chutneys, including tamarind, chilli and garlic. It is then seasoned with sev which are small pieces of crunchy noodles made from chickpea flour, raw mango, the tint of chaat masala and some lemon juice. You must checkout the Sharmajee’s and Badshah’s at Girgaon Chaupati Beach at Marina Drive for the delicious sevpuris. Ragda Patty is an essential part of the chat family found all over India. 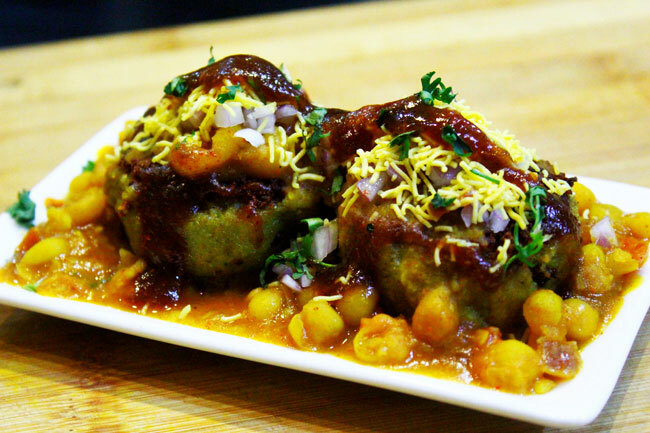 This street food is said to be twin delight due to its combination of ragda, which is soft and spicy rugged flavored chickpeas, and patties, which include the mashed potato shaped into a pattie, and fried. The best way to eat the ragda patties is by crushing the ragda with the patties and pouring all the accompaniments including the chopped onions, tangy tamarind sauce and some fiery green chutney together. Mash it up well to dig all the savoring flavors of Mumbai. Looking for the best Ragda Patties in Mumbai, try it at Kailash Parbat, SheelaMahal, 1st Pasta Lane, Colaba, which offers a meal at Rs. 400 for two people. This is the street food which has been inspired by the Lebanese pita bread and thus been Indianized. It is the Tibbs Frankie which is the one behind satiating hordes of the hungry in search of some lip-smacking snack. The snack is nothing but a delicious naan having the coating of an egg, and is stuffed with chicken or mutton, rolled up and sprinkled with some special spices that add up to its flavor. For the vegetarians, the egg variant is removed, and the naan is stuffed with paneer or potatoes. They are available in every part of the city. Look for a Tibbs Frankie closest to you to enjoy this snack; it offers The Frankie for two at Rs. 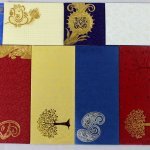 350. 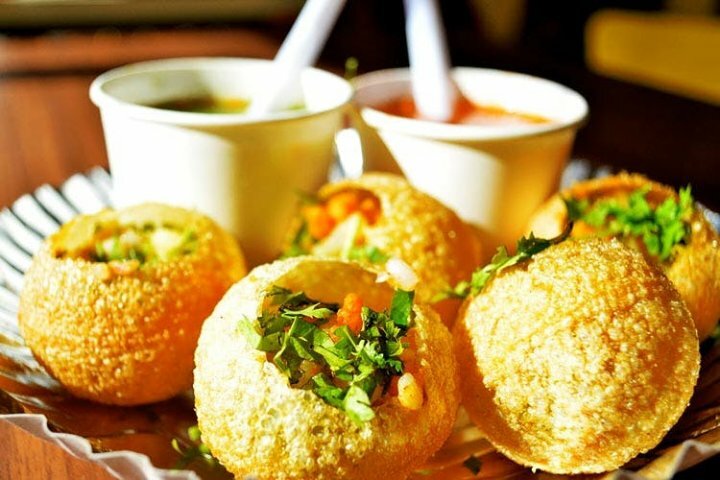 Pani Puri is a staple for every chaat lover, but where to find the best? The Elco Pani Puri Centre is famous and has been claimed as one of the best Pani Puri centres. The crunchy puri with the tangy water, which is a mix of tamarind chutney, chilli and chaat masala and with the potato and onion stuffing, this is the heaven for the chaat lovers. The Pani here is made up of mineral water, and you can quickly grab a meal for 2 for Rs. 150 here. It is another famous street food of Mumbai which is regarded as one of the easiest to make. The Kanda poha is a staple dish in the Maharashtrian families, and you will hardly find anybody who would make the poha badly. 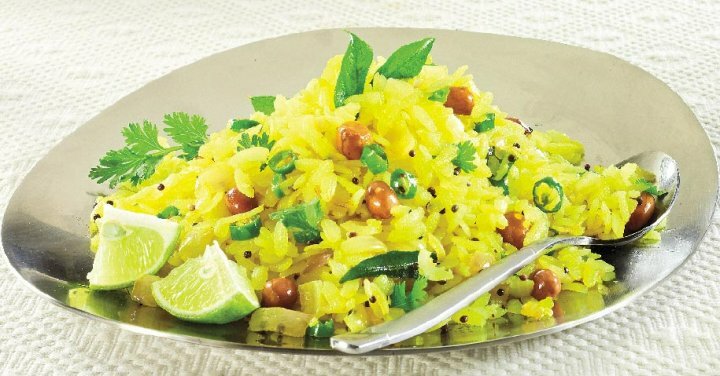 This simple snack is made with Kanda which are the onions and Poha which is the flaked rice. Both the ingredients are then mixed with finely chopped potatoes, green chillies or even peas sometimes. The dish is then tempered with some mustard seeds and seasoned with some coriander leaves and a squeeze of lemon. Though this dish can be easily made at home, tasting it from the local streets is a unique experience. Try the Kanda Poha at Aaswad, L J Road, Opp. Shiv Sena Bhavan, Dadar where one can easily have a meal for 2 at Rs. 300. Being a delight which is provided to us by the Mughal kings, it is a modern twist to faloodeh, which is a Persian dessert. 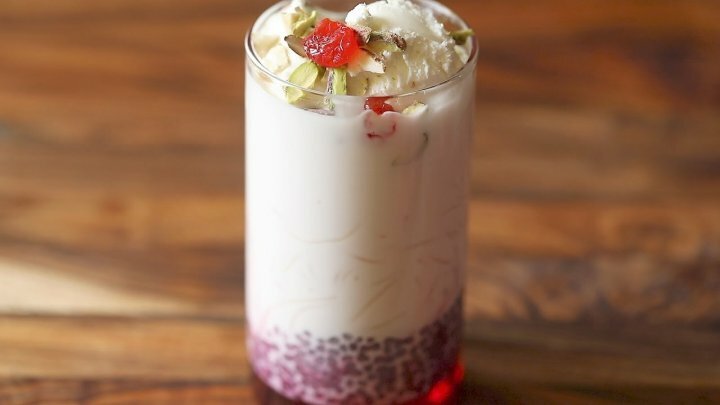 Falooda is specially made up of vermicelli, thick milk, rose syrup and sabja seeds. We even find Kulfi in many variants making it a kulfi falooda. There is no one in Mumbai who is not a fan of this creamy delight. Most of the Mumbaikars rush to the Badshah in the Crawford street. Badshah is relentlessly serving the city with its delicious cuisines and most specifically, the Falooda, for over 100 years. You can easily get a meal for 2 at Rs. 150 here. If visiting, do try the Badshahi Falooda and its famous Falooda with ice cream. Want to have a sandwich with the most unlikely ingredients? Try the Bombay sandwich which is the most exciting street food invention with some lavishly buttered white bread sandwiched between the rich slices of boiled potato, beetroot, cucumber, onion rings, tomatoes and mint chutney. 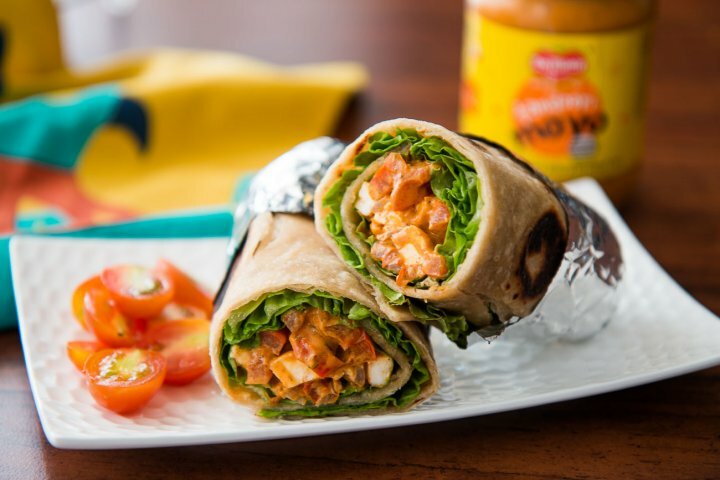 The sandwich is cut into four pieces to avoid spilling and to get the most refreshing tangy taste with every bite. 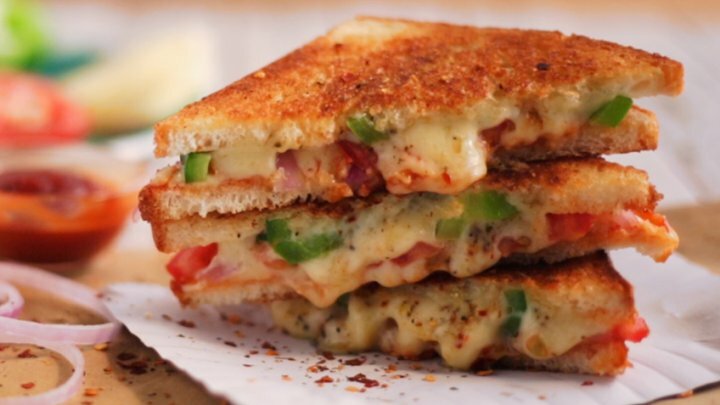 A toasted version can greatly enhance the flavor. Though the sandwich is widely available in the city if you are craving to have one of the best, try it at the Raju Sandwich Stall, opp HR College, having an average meal range of Rs. 250 for two people. Popularly known as Aloo Bonda, it is the famous street food that consists of potato mashed patty coated with some deep fried chickpea flour. 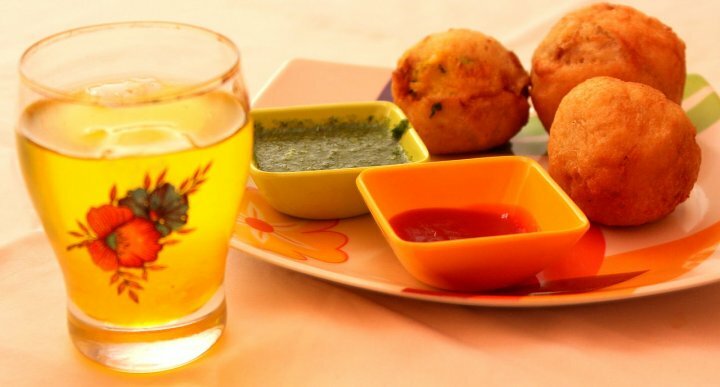 Whether, it is breakfast, teatime or any other time, it is certain that the Mumbaikar cannot live without a bite of Batata Vada. Seasoned with salt, turmeric, lemon juice and red chilli powder, this food is served with green chutney and fried green chillies. Every street corner of Mumbai will undoubtedly have an outstanding Batatavada seller but the ones at the , Shri Krishna near Chhabildas High School, Dadar Market, offering a meal for 2 at Rs. 400, are hard to beat. Though there are many delicious, exciting and lip-smacking dishes that Mumbai offers, if you are visiting Mumbai, it is essential that you try the Aloo Puri at the legendary Pancham Puriwala. No one confesses about their liking, but the Aloo Puri is India's favorite food across the states. The puri is the Indian pan bread which is found in every kitchen. 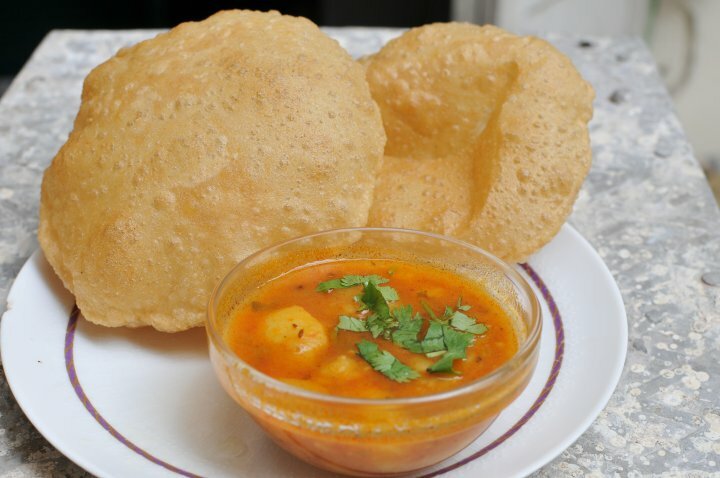 Thus, when nothing seems to interest you in Mumbai, try having the delicious AlooPuri. A well fed person is a happy person. So stimulate your taste buds by trying these dishes. Guaranteed, you will enjoy these and would want to visit Mumbai again and again!